So you’re at a party, and someone says something ignorant . And while you know they’re in the wrong, your words escape you. To make sure that doesn’t happen, we’ve compiled a series of handy reference guides with the most common arguments — and your counter-arguments — for all of the hot-button issues of the day. 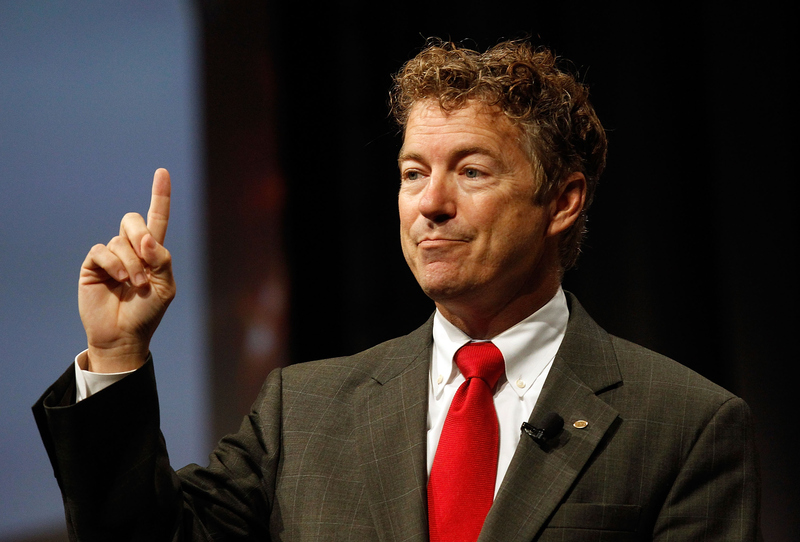 This week’s topic: How to argue against Rand Paul becoming president. Common argument #1: Rand Paul is more principled than most politicans. Your response: Not really. Earlier this year, he proposed cutting all foreign aid to Israel, then stubbornly denied that he’d ever made such a proposal. He relentlessly criticized the National Security Administration for spying on Americans, then helped defeat legislation that would have reigned in that spying. He devoted a 13-hour filibuster to condemning drone strikes, then said later that maybe he’s okay with drone strikes after all. Common Argument #2: Rand Paul makes the Republican Party more appealing to minorities. Your response: I’ll give you this: He did give a speech at Howard University, something most Republicans probably wouldn’t, and don’t, do. Even if his speech wasn’t well-received, it was a nice effort. A free society will abide unofficial, private discrimination, even when that means allowing hate filled groups to exclude people based on the color of their skin. That’s an unambiguous assertion that private businesses should be allowed to discriminate based on race — at least, in a “free society.” Oh, and there was the time he wrote a book with a white supremacist, then hired him on staff, then defended him when people started pointing out that he was a racist. So no, Paul won’t “break down some of that wall” between the GOP and minorities, despite his sincere desire to do so and become president. Common argument #3: Rand Paul is just an honest, respectable guy. Your response: When he was caught plagiarizing Wikipedia and other sources, Paul denied the charge, even though it was verifiably true, then said he wanted to shoot the reporters who wrote about it. He attempted to shame Hillary Clinton for staying with Bill, who he called a “troglodyte,” and recently attributed Eric Garner’s death to cigarette taxes while expressing sympathy for the “difficult position” that the arresting officers were in). He also scampered away from a meet-and-greet halfway through his burger in order to avoid a conversation with an immigration activist. So no, he's not a decent guy. Common argument #4: Rand Paul is hip with the kids! He’ll appeal to young people! Your response: Paul opposes gay marriage, which over two-thirds of Millenials support. Young people overwhelmingly favor a big, active government, something Paul obviously doesn’t like (except with regard to abortion access, which he believes should banned at — gasp — the federal level). Paul opposes the Affordable Care Act, which young people like, and opposes a path to citizenship for undocumented immigrants, which young people also like. He wants the US to withdraw from the United Nations, a draconian position that young people emphatically oppose, and so on. There’s also the fact that millennials, when polled, just don’t seem to like Paul very much: A FiveThirtyEight analysis found that Paul’s support trails by about 17 percent amongst young Americans when compared with the population at large. But let’s give credit where credit is due: Paul did join Vine and Snapchat. That’s sort of a young person-y thing to do. Common argument #5: Rand Paul isn’t like other Republicans. He’s an independent-minded rebel trying to shake things up. Your response: That may have been true at one point: Paul was the scrappy underdog outsider during his first Senate run, and vanquished the chosen candidate of Minority Leader Mitch McConnell. But once he was in the Senate, Paul quickly buddied up with McConnell and the rest of the Republican leadership, and a party strategist recently praised him for “his quick willingness to get on board” with the rest of the GOP. Here’s Paul during the government shutdown fight, plotting strategy with McConnell when he doesn’t realize the microphone and camera are still on. Paul tows the GOP party line on almost every issue there is: Taxes, immigration, health care, education, job creation, abortion, gay marriage and so on. And while he has disagreed with the GOP on some foreign policy issues, even that’s changing: Paul now supports US aid to Israel and has introduced legislation to declare war on ISIS, which be America’s first formal declaration of war since 1942. On almost every substantive issue, Rand Paul is, reliably and thoroughly, a Republican. Being hated by John McCain doesn’t make him a rebel.